A new simulation from the C-ROADS team is coming! We’re working on an extension of C-ROADS that helps decision-makers take such a long term view. The picture here captures many of the scenarios we can imagine. 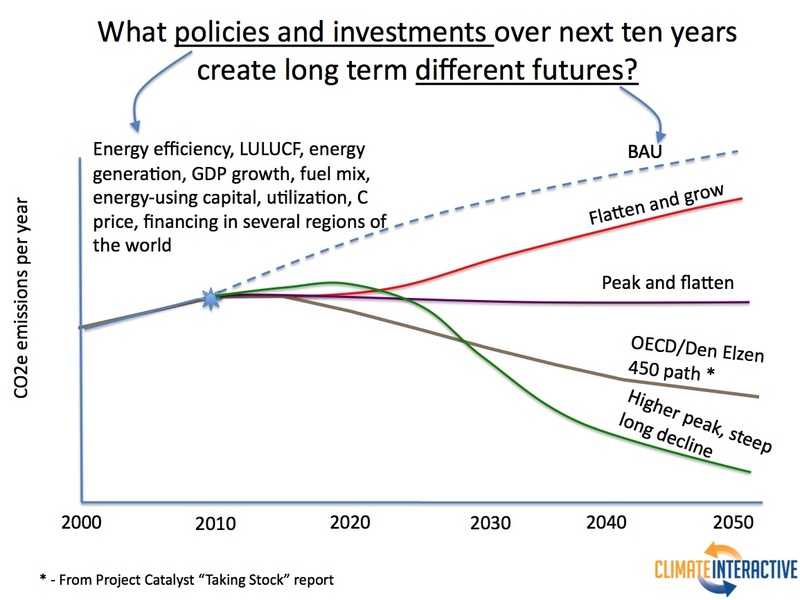 Most concerning to us are the red and purple curves — what if we pick the low-hanging fruit of easy mitigation without “building the ladder” to “pick the higher hanging fruit” and continue reducing emissions after 2020? We have a first version of the simulation that builds on modeling insights from Dr. John Sterman’s MIT thesis and models of Dr. Tom Fiddaman. Dr. Lori Siegel is working on it this week. We’re lucky to have many other models and scenarios to draw upon – GCAM, MARKAL, the SRES database et al. The modeling work is being supported by Zennström Philanthropies and the Morgan Family Foundation. And we’re currently open to including more partners.